A mature tree lies in the middle of the proposed catio site. So we built a hole into the shingle roof (which matches the house) and also designed all ramps and platforms around the tree. The family also intends to tie a cat hammock to the tree. The catio also sits next to a pathway that needs to remain open for the gardner and general passage through to the backyard. 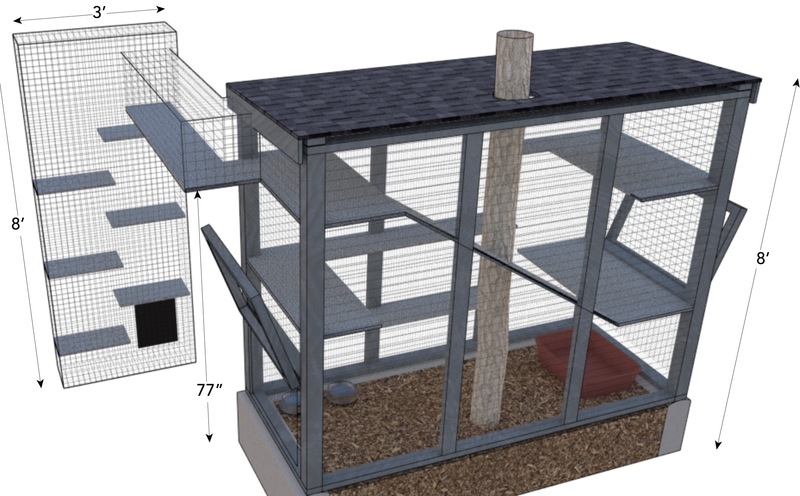 As such, we designed a sort of chimney for the cats to exit the existing dog door and then move straight up along the house wall until they reach a bridge six feet above the ground which connects the house to the enclosure. Finally, because of the size and elevated location on an existing planter, we built in two 24″ tall hinged access doors on each side of the catio instead of a door. This will still enable the human owners to clean the kitty litter and easily access the catio. This was a fun project. Our specialty is taking any environment and making it work for both the cats and the human owners.